Chicago, IL—April 23, 2016—Coyote has been named to Transport Topics’ list of the Top Freight Brokerage Firms, ranking number five of 91 companies. This is Coyote’s third year on the list—in 2015 Coyote ranked number four; in 2014, number 41. 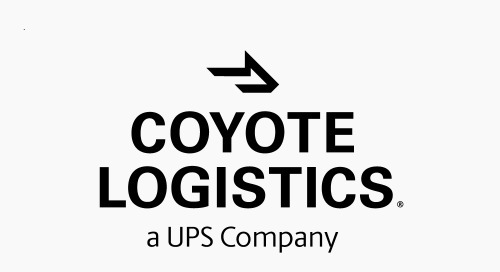 UPS, which acquired Coyote in 2015, ranked number one on Transport Topics’ list of Top 50 Logistics Companies in North America. Ten years after its founding, Coyote continues to be fiercely dedicated to service, commitment, and innovation in the transportation and logistics industry. Coyote offers truckload, less-than-truckload, intermodal, cross-border, and supply chain management services to more than 14,000 shippers of many different sizes and industries. Coyote became a UPS company in 2015, giving it access to the largest asset fleet in the country. The acquisition allowed Coyote to add UPS asset utilization, air freight, ocean freight, customs brokerage, and much more to its portfolio of services. Coyote is powered by 2,000 employees in 17 offices. Transport Topics’ Top Freight Brokerage Firms list was compiled based on revenue estimates provided by logistics industry consulting firm Armstrong & Associates. For more information, please visit www.ttnews.com.